Mr Hariprasad has during his campaign also promised to introduce trains in tier-2 cities and increase the frequencies of the current ones. 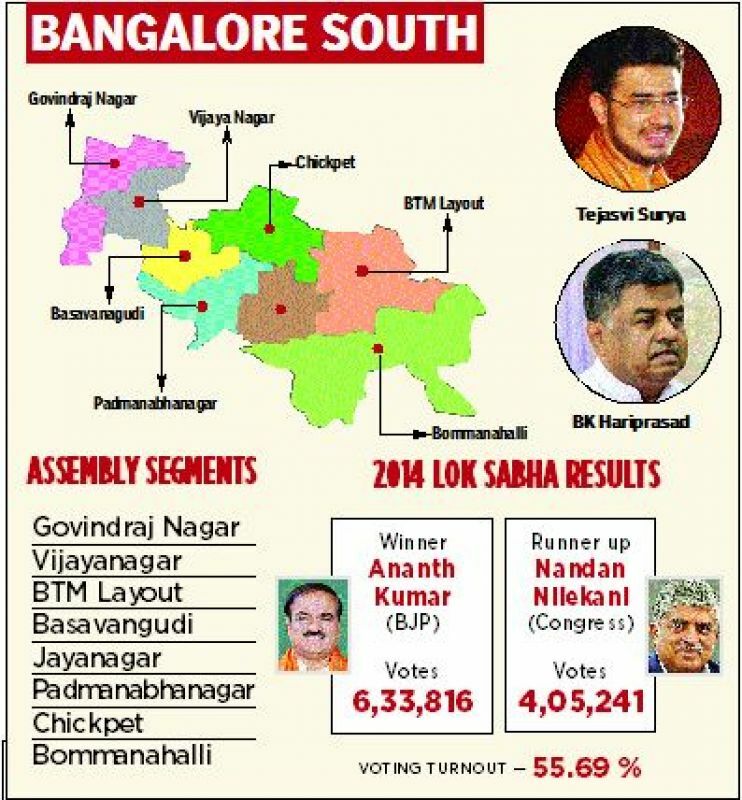 With the last day of campaigning drawing near, the momentum of party workers of both the Congress and the BJP has picked up pace as they hurry to do the rounds of the Bengaluru south constituency, dominated by Brahmins, Vokkaligas and Muslims. Having won from here time and again in recent years, the BJP has the added advantage of having five MLAs from the constituency in its kitty, two more than the Congress' three. Although accustomed to having the late Union Minister Ananth kumar as their representative in parliament for years, BJP supporters here seem to be willing to give a chance to 28- year- old Tejasvi Surya, the party's pick as his successor these Lok Sabha elections. 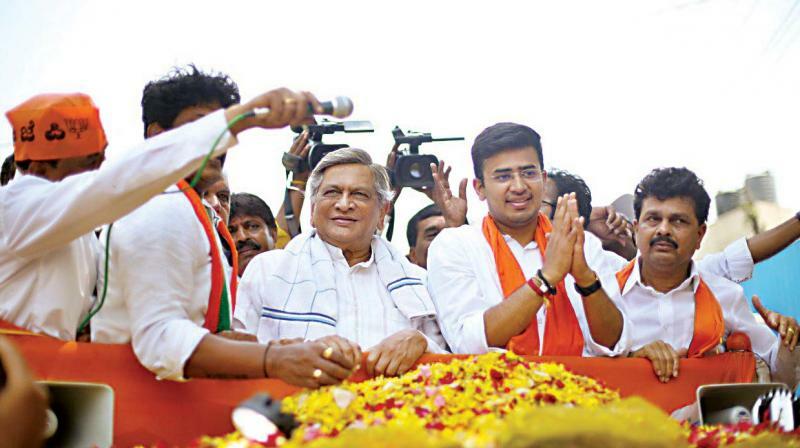 While the youth in Jayanagar relate to him naturally, seeing him as young and dynamic, traditional BJP voters feel the constituency could get an overhaul should he win. 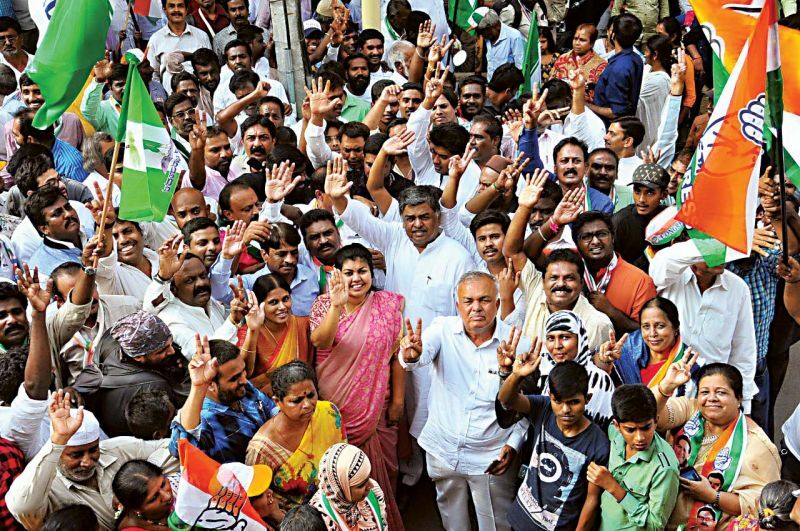 As the young leader's car passes through the South End Circle amidst pro-BJP slogans, an owner of a small eatery shop in the area, Shivanna observes, "Tejasvi has a good connect with the constituency. The BJP has given the country a strong image with the Pulwama revenge, which has sent the right message to Pakistan." Balakot and the surgical strike does seem to have struck a chord with the young voters of the constituency and the promise of the BJP in its manifesto to remove the special status conferred on Jammu and Kashmir too seems to resonate with them. Mr Anshuman Roy, an IT professional, feels that with Prime Minister Narendra Modi at the helm of affairs in the country, the nation's security will get prime importance. "The late former Union minister, Ananth kumar was liked by everyone and he would have got the votes this time too. The fact that the party has fielded a young candidate, who is eloquent in his views, has made my faith in the BJP leadership stronger," he adds. At 5 pm, as the cavalcade of the Congress veteran, B.K. Hariprasad, passes through Tilak Nagar, Congress supporters welcome him with party flags and slogans of "Chowkidaar chor hai." Mr Akshay S, a social worker, recalls that the Congress leader had lost the 1999 Lok Sabha election to Mr Ananthkumar and was later picked for the Rajya Sabha, where he is still a sitting member. "Despite this he is well known to the people as he has been associated with many official bodies, including the Karnataka Slum Clearance Board, Central Silk Board and Indo-Turkey Parlia mentary Group at different times and in various capacities. We the people of Bengaluru South are hoping for a change this time based on his agenda. His plans for the public sector, which has a major role to play in employment and development, to get water for south Bengaluru from Mekedatu, and develop a green patch like Lalbagh in Bommana halli will help him win," he contends. As the convoy prepares to head for Banashankari, one of the party workers on a bike, Revanna, stops briefly to say, "Although I am not adept at how the Indian economy works, I can still list out the thoughtless and dictatorial decisions like demonetisation and poorly implemented GST taken by the BJP regime. Also, the polarisation of society is a threat to the secular fabric of the nation. We need someone like Hariprasad, who is sensitive to the problems of the youth too."